This easy scrap quilt block pattern explains how to make sixteen-patch quilt blocks and surround the blocks with triangles to put the design instantly on point. Tailor the sixteen-patch quilt blocks to suit any color scheme and sew them either orderly or scrappy. You can assemble the quilt blocks one piece at a time or construct strip sets to sew rows together more quickly. The block's corner triangles are easy to cut. Oversize triangles are an option and offer a unique look–they completely encircle the central design and make blocks appear to float once all blocks are sewn together. Finished block size: 12-inch by 12-inch unless you use oversize corners. See the third slide for a sample quilt layout. Although the illustration shows a scrappy quilt block, you can make the sixteen-patch as scrappy or orderly as you desire. For an orderly block, choose as few as two contrasting fabrics and alternate them from row to row. Or assemble strip sets as shown above and then cut segments from them to create ready-made rows for the block. Strip pieced scrap quilts are doable–instead of using long selvage-width strips, construct more strip sets from shorter strips, varying fabrics as much as possible in each set. Cut sixteen 2 5/8-inch by 2 5/8-inch squares (use at least two different fabrics or go as scrappy as you like). Sew the squares into four rows, each row with four squares. Press seam allowances in adjoining rows in opposite directions and join the rows. Press again. You will need four rows for each quilt block. Each row requires four strips of fabric. Each strip in a strip set is cut 2 5/8 inches wide. Cut 2 5/8-inch segments from each completed strip set. Beginning quilters should read my strip piecing tips and techniques. So let's do a what-if example for four strip sets, each producing four segments. Use 16 different fabrics or repeat fabrics here and there. Place contrasting fabrics side by side if you like or let the arrangement be totally random. Cut sixteen strips of fabric, each 2 5/8 inches by 11 inches. Sew four strips together lengthwise as illustrated. Press to set the seams. Press seam allowances in one direction. Square up one end of the strip set, trimming off as little of the leading edge as possible. Beginning at the squared up edge, cut (4) 2 5/8-inch segments from the strip set. Repeat, making four more strip sets and cutting four segments from each for a total of 16 segments. 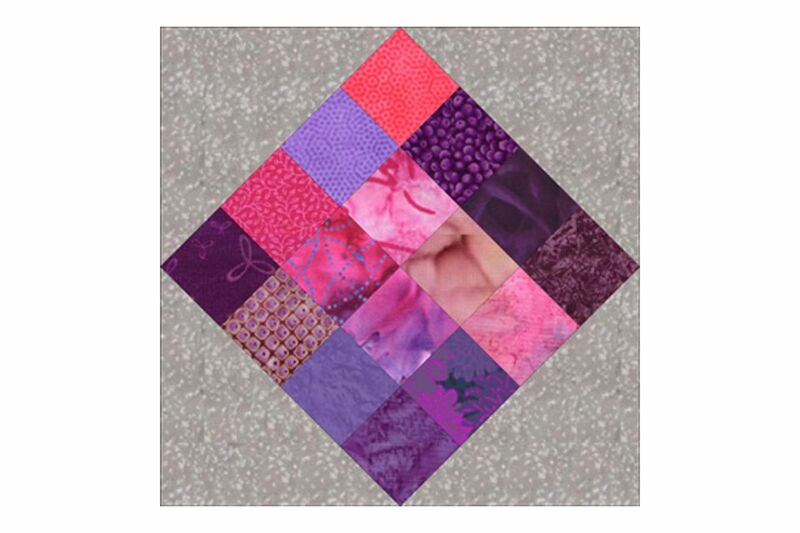 Choose four different segments and sew them together into rows to create a patchwork center for the quilt block. If necessary, gently re-press seam allowances in a row to help make seam alignment easier. Make three 16-patch block centers from the remaining row segments. Cut two 6 7/8-inch by 6 7/8-inch squares of background fabric. Cut each square in half once diagonally to create four triangles. Fold each triangle in half to find the center point along its longest edge (or trim triangle tips to make match-ups a breeze). Center and sew a triangle to each of the four sides of the patchwork center. Press seam allowances towards the triangles. Cut additional backgrounds and repeat to finish remaining quilt blocks. Use longer strip sets to make larger batches of identical row segments. This example of a sixteen-patch quilt illustrates a layout with blocks sewn horizontally but separated by sashing and cornerstones.